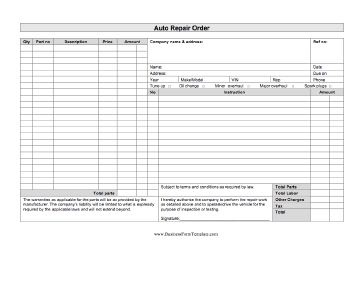 This business form can be used by a garage or auto mechanic to write-up the service required for a customer's vehicle. Space is provided to track parts and materials, as well as labor. Subject to terms and conditions as required by law. The warranties as applicable for the parts will be as provided by the manufacturer. The company's liability will be limited to what is expressly required by the applicable laws and will not extend beyond. I hereby authorize the company to perform the repair work as detailed above and to operate/drive the vehicle for the purpose of inspection or testing.